This is the basic layout to begin piecing your pincushion. It is constructed in the same order as the english paper pieced directions. However, this is a bit quicker. Begin by piecing 2 of the 6-point diamonds together. Add a third diamond to each pair. You will have 2 halves. After machine piecing this pincushion 3 times, I ended up marking my hexagons with a 1/4" dot to indicate where the seam should start and end. It is CRITICAL for success with machine piecing. Next take 1 hexagon and with right sides together pin on the a diamond. Please use the original design above as your guide and carefully flip the hexagons in the correct direction. This is a close up of piecing. I start and stop at the black dots. Again, to piece the y-seam, I would start and stop at the black dot. Then I would remove the piece from the machine and pivot the fabric to match the next dot of the y-seam. Continue sewing and the result is below. Press seams toward the hexagon. Sew the center seam of the 6-pointed star. The result is a 6-pointed star surrounded by hexagons. Next week I will show you how to add the second 6-point star and complete the pincushion. 1. Don't be alarmed if your star is puckered up a bit. This is a pincushion and will be 3-D and with a button in the center...the puff/pucker will disappear. 2. Go slow and make sure you start and stop on the 1/4" dots. 3. It's okay if it's not perfect or you have a 'hole'. Flip the fabric right sides together and take a few more stitches to close the seam. Flip it back, and check, seam closed! p.s. I made the machine pieced pincushion 3 times. There are pictures from all 3. 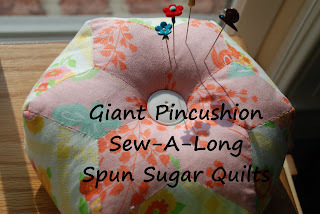 I will show you "completed" pincushion pictures at the end of this sew along. Please comment any questions and I will try to answer you ASAP. Keep in mind I work Monday-Thursday so I sometimes get delayed in responses until Friday!